Mayoor School incorporates state-of-the-art infrastructure and facilities that support academic and co-curricular learning. 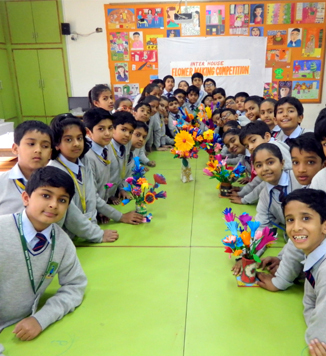 Separate environments have been created for Pre-primary and Primary School, Middle School and the Senior School which includes an advanced Academic Block and the Science and CIE block. The buildings have been designed to be user friendly and support the transaction of a modern and comprehensive curriculum. The tiny tots begin their first step towards school life in this block. The pre-primary block comprises nursery and kindergarten sections (Lower kindergarten and Upper Kindergarten). The Primary Block houses the classrooms for grades I-V. The primary block has its own facilities which include Computer Lab, Library, Music Room and Art Room. EVS laboratory is an attractive facility in the block that supports learning about environmental science. The quadrangle inside the block serves as the stage for primary school assembly and co-curricular activities. The middle and senior school block caters to the educational needs of the grades VI-XII. The students have comfortable access to the Information-Technology Centre, Science Labs, School Library and Music School. The Art and Craft lessons are held in the Kotah Art School.